ION development has been very active in the last 2 weeks. Last achievements are the implementation of ADC readouts and power stage control. Both were discovered to have some schematics & layout errors, but that’s why people make prototypes. Ion development rig as it exists today. Tiny jump wires on ION board have appeared. After fixing the issues by PCB trace cuts and jump wires, the drive seems fully healthy. ADC readout of phase currents seems to perform well with extremely low noise and power stage seems to exceed the initial capability calculations. 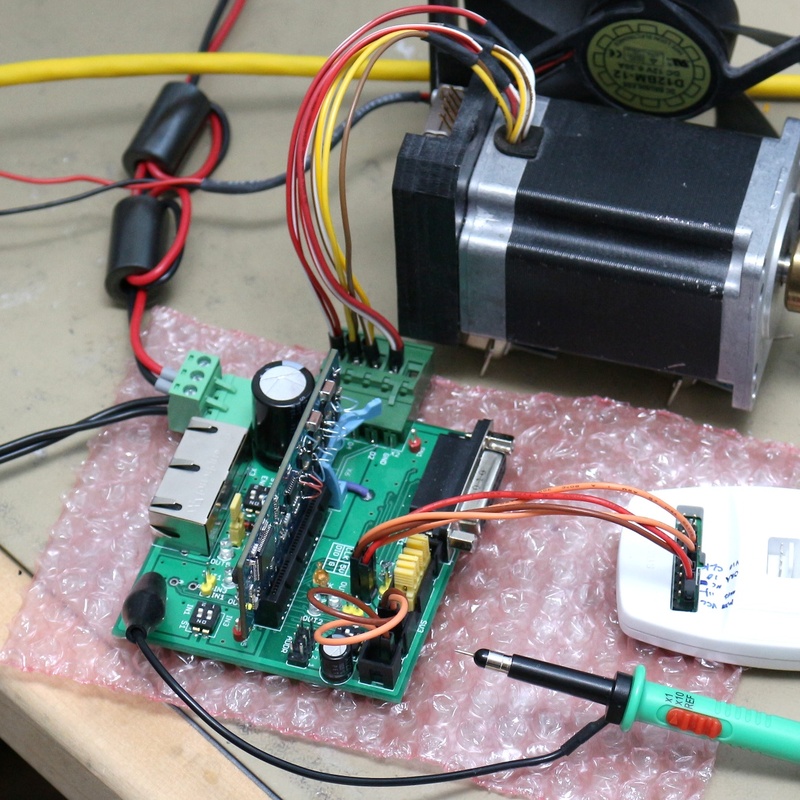 At the moment power stage temperature is 63 degrees Celsius while it outputs 8 A continuous current to the stepper. Some air flow is present from the fan behind the motor. Good news! The very first fully assembled ION servo drive boards have arrived. I jumped straight to programming the thing. Few parts of code have been already ported from Argon and everything has worked flawlessly so far. 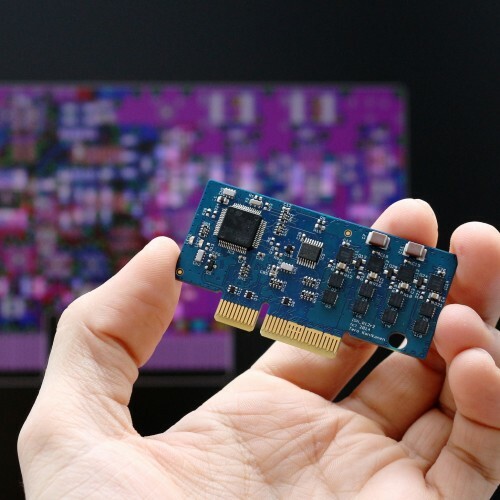 The drive is equipped with ARM Cortex M4 processor with hardware floating point unit (FPU). I ran small test of FPU performance and found out that simple floating point arithmetic operations execute 20-30 times faster compared to non-FPU code. This means, all control code can be written with floating point math yielding ultimate precision and dynamic range without sacrificing servo bandwidth. The first batch of new servo motors are here! 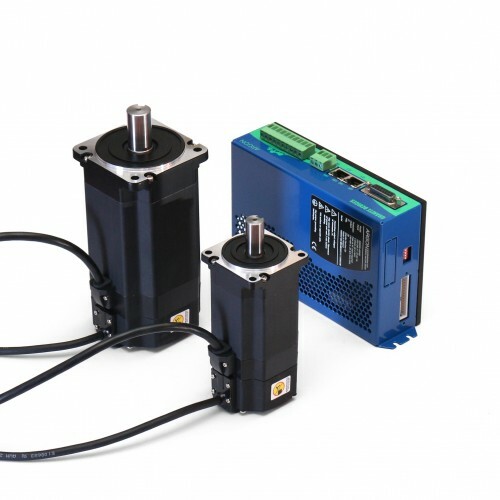 The stocked selection includes 400 W and 950 W rated of low inertia AC servo motors. 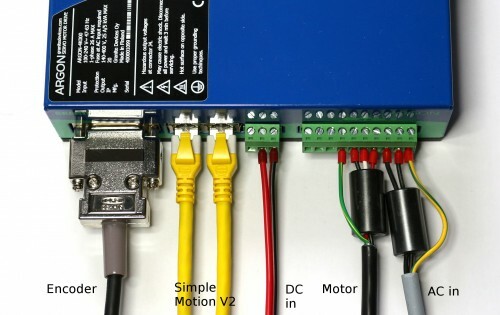 Both models come with 2 500 PPR (10 000 counts/rev) encoders and pre-assembled 4 meter long cables that plug straight to the Argon drive saving from the hassle and chance of error. New 400W and 950W motors. The new servos are notably lighter and smaller than equivalent motors from few years back. They weight approximately 1/3 less than equal power Sanyo P5’s. 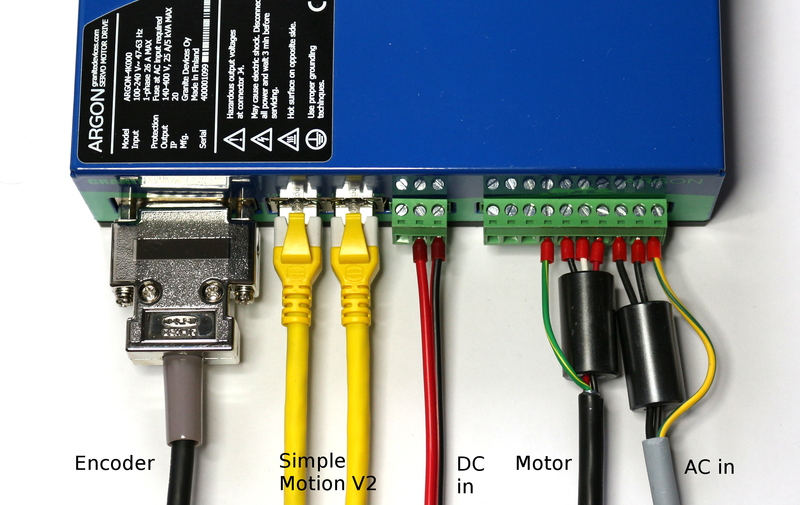 Servos will will appear in the web shop during the next days. Detailed specifications of motors are already online at the Wiki. The specification PDF lists all available models from 30 W to 950 W which are available on order. All sizes are optionally available with a holding brake.